Our Jam Sessions are weekly 1-1/2 hour rehearsals on a large stage with lots of pro-equipment. Open to all ages but must be at a level to play complete songs. An awesome way to gain stage experience! All jammers must bring Guitar, Bass, Instrument Cables and Drum Sticks. We provide Amps, Drums and Keyboards. Great program for the young rocker, Kids get together, Jam and have lots of fun!! Many of our jammers bring their friends to join in . This is one of the ways we pick musicians for our well known Award Winning Teen Bands. 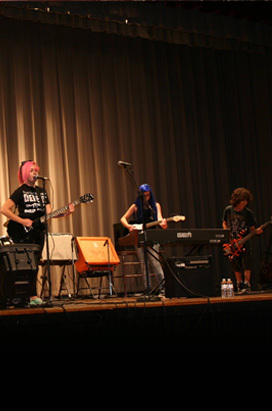 Many of the teen jammers start in Jams then graduate into our Rock School Program. Stay tuned for the Adult Jams time. Jams are a fun and great place to start — Contact DeAngelis Studio of Music & Arts and join are jammers!